November 24, 2014 - No Comments! While I spent most of my teenage time playing online RPGs through e-mail or forums, I have never played tabletop RPGs. This huge gap was corrected when three of us coursemates got together to play a short, two-player campaign in Vamprie: The Requirem. At 11PM we went in thinking it would only take 3 hours. It lasted until 7AM. There was something very magical and very tirering about emerging from such an immersive experience to the sun rising that I can only compare to the first time I took off an Oculus Rift. Overall, it's definitely something I wan to do more of. We have received our grades from our first theory assignment and I am extremely happy with mine. The essay centred on "The Role of Spatiality in Creating Immersion in Digital Games" and without saying too much, I'm looking to expand on it in various ways. The design assessment, too, has begun. We are to create and pitch a game by the 10th of December in teams. Our team has been very organised and very quick at getting things done. In the first day we already had a company and a high concept of the game. Within the next few days, three of us sat down to sketch a few levels. We worked very well together! Giovanni was particularly good at narrative while Pong was very good at mechanics. We bridged the two really well and created a document of these levels which the rest of the team expanded on. 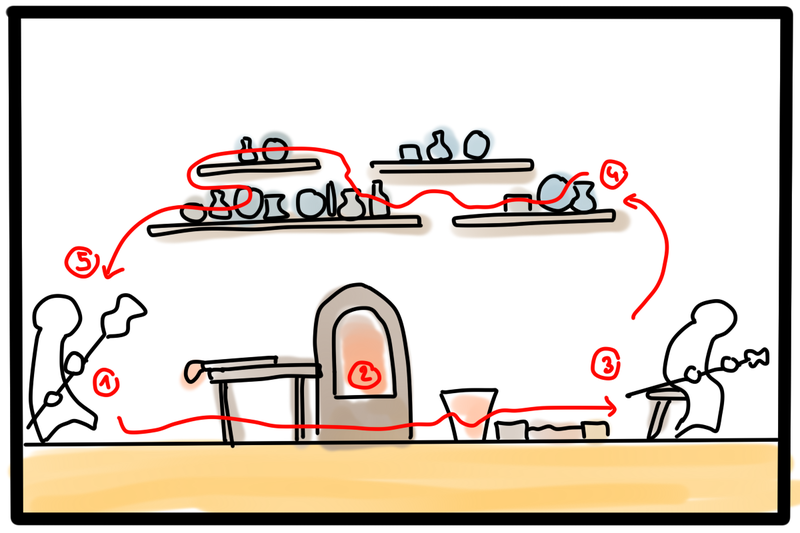 In this document, we first discussed the narrative, illustrated how this narrative would look spatially, then showed the individual mechanics and puzzles inside the level. I specialised in illustrating the bridge between narrative and mechanics. While we are all involved in a bit of everything, we have assigned "leaders" to particular sections of the assignment who organise and make sure our presentation answers particular aspects of the requirements. I have taken on the role of Technical Artist so much of my time will be spent creating the demo for the game, doing soft programming, managing the asset pipeline and making sure the game design is feasible for us to actually create. My main concern is that it might be too much work and many hours fighting with MMF2.5 however I can already sense how rewarding playing the final demo will feel. As for the demo, I have expanded on the "Sir, don't forget your hat" experiment. Now, more than just collecting and stacking hats, the character can upgrade them. The code has expanded massively and I've learned quite a bit about more complex value systems and ways in which we could create the demo for the design assessment. Sections of the code and various screenshots are found below and you can download play the game here. At this point, the character could only put on hats in different orders and take them off. The code was fairly simple however it got more complicated when I added an upgrading system for each of the hats and a final condition when you upgrade and wear all the hats. As a guest lecture, we had Richie from UKie. He was very engaging and showed us quite a few resources that we have as game students in the UK. For those game students reading this that might not know, UKie offer networking events, course support and overall awesome links between students and the UK games industry. For those looking to improve their job opportunities, discuss what they might want to get into once graduating, ect, their website is http://ukie.org.uk and every student is registered for free.